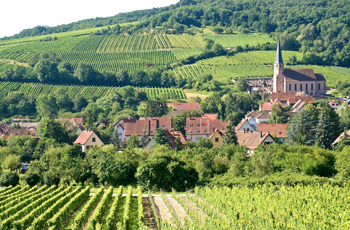 Award-winning cuisine, fairy tale villages and world-renowned wines are all yours in Alsace. Enjoy the charming villages and the warmth of the locals as you explore this beautiful, culturally unique corner of France. Hearty food, thriving markets, and lovely scenery await. Stay in a vacation apartment in the French countryside, in the vineyards, an easy walk to town. Day trip options: The villages of the Route des Vins, Strasbourg, the Petite Venise neighborhood in Colmar, Ecomusée in Ungersheim, and more! Sightseeing: The majestic pink sandstone cathedral in Strasbourg, Petite Venise (“little Venice”) neighborhood in Colmar, Ecomusée in Ungersheim, the beautifully restored Haut-Koenigsbourg castle. For a change of pace, try the well-reviewed automobile museum in Mulhouse or a dramatic mountain drive through the Vosges. Off-the-beaten-track attractions that can’t be beat: Hikes in the Vosges Mountains and a stop at a ferme-auberge for a hearty, homemade lunch; local village festivals dedicated to regional products such as wine, cheese, and choucroute (a delicious dish made of sauerkraut, potatoes, meat); a bike ride through the lush vineyards. Lovers of great art should not miss the world-class collection (some of Cezanne’s, Monet’s, Klee’s and Rothko’s best pieces) in a small, jewel-like museum called Fondation Beyeler, just outside of Basel. "As usual, we had a wonderful Untour! This was the first time we needed to rent a car. It did add a small element of stress, but we were glad to be able to get to sites that were not available by public transportation.